The Friday-evening music concert was unusually melodious for the connoisseurs of Hindustani classical music rather, a double treat for the discerning kaansens of this culturally rich city of Belagavi, who had their date with the flute recital and also to listen to a highly soothing and captivating raag marwa after a long time. 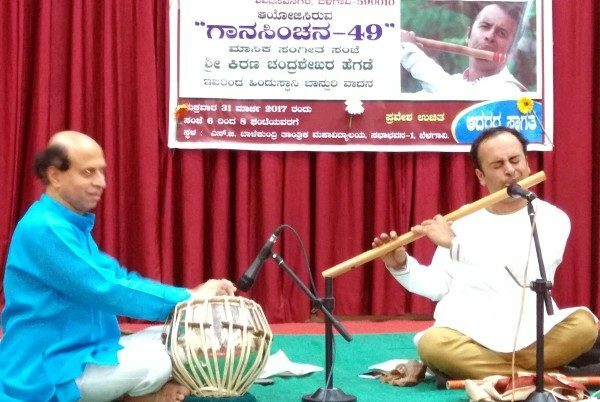 Belagavi, Apr.1: A double treat by flautist Kiran Hegde.  PHOTO: BY P.K. BADIGER. The treat came from Kiran Chandrashekhar Hegde, an accomplished flute player from Sirsi and a graded artist of AIR in whose recital became apparent his unpretentious simplicity. The melody kept flowing unpretentiously with the flautist strictly adhering to the form and content of the evening melody chosen for the occasion. He was performing at the monthly music concert “Gaansinchan-49” organised by S.G. Balekundri Institute of Technology at its premises in Shivabasava Nagar. Mr.Hegde, received his early training in basics of Hindustani music from vocalist Vid.Prabhakar Bhat of Sirsi and subsequently veteran flaultist Pt.Venkatesh Godkhindi. He is currently taking his higher lessons to incorporate gayaki ang of the Gwalior gharana from the renowned violinist Padmabhushan Dr.N. Rajam. Some of his achievements include Pt.D.V. Paluskar Memorial Award and the title of “Suramani” by Sur Singar Samsad, Mumbai. He has performed all over the country and abroad, including at the prestigious ITC Sangeet Research Academy, Ambarnath, Abdul Karim Khan Memorial Festival at Miraj and Hubballi and Acces ASIE Festival, Montreal. He also performs “Jugalbandi” concerts and composes music for stage plays. He has established “Muralivan heritage for the culture”, an association to promote cultural activities. Taking off on a highly captivating resolution that instantly establishes the mood of marwa, he settled down to explore the composition over vilambit ek-taal and concluding the opening melody with Ustad Ameer Khan’s bandish ‘Guru bin gyan…’ However, despite efforts of flautist to sustain the mood, the immediately following composition in kirwani raag fell short to take out the audience from the influence of well rendered marwa. Senior percussionist from Mumbai, Pt.Vinayak Naik (originally from Belagavi) elevated the flute recital and exhibited the art of tabla-accompaniment.